Paint is a major issue with the Tesla Model 3. Of that, there is no doubt. It’s an amazing machine in terms of performance and pizzazz, but when so many reports keep trickling in about unsatisfactory paint jobs, chips, bubbling, “orange peel” effect, color mismatch and a plethora of other problems, it’s time to wonder what’s going on in the paint shops at Tesla’s Fremont factory. A recently uploaded YouTube video by Engineering Explained shows several imperfections on a brand new Model 3 that was delivered with 22 miles on the odometer. The video looks neutral, meaning it doesn’t appear to be a smear campaign against Tesla’s latest EV model. Seen in that light, it does throw open some questions about the quality control processes at the Fremont factory from where the car in the video was dispatched for delivery late in November. Starting at 2:38 on the video, the presenter talks about paint scratches, paint defects, panel gaps and other issues. The comment thread reveals even more issues, but none of these have been verified to be true, so it is anecdotal at best. The actual video, however, seems authentic enough and up for discussion. The key problems highlighted in the video are with paint and fittings. Interestingly, most of the scratches appear to be on the driver’s side. They are also quite deep, having crossed the clear coat layer into the paint itself, as seen in the video at around 3:40. The video continues to highlight paint flaws like dust under the clear coat and the “orange peel” effect on the paint texture. Next, the presenter starts measuring differences between the gaps on the left and right side of the car, comparing it with similar measurements on his Subaru Crosstek. The comparisons clearly show that the Model 3 has a much greater variance than the Subaru with respect to panel gaps. The video is posted below for your reference, starting at 2:38. Below that is an analysis of factors that might be causing such issues. First of all, you can either see this as an isolated incident or as part of a prevalent trend that is not very encouraging for potential buyers. Other Tesla owners have reported similar issues, and you’ll find them in Tesla forums and other independent platforms like Reddit, Tesla Motors Club and Model 3 Owners Club. When looked at in light of other complaints, it draws attention to Tesla’s paint quality control for the Model 3. While no major issues have been reported that would impact the performance or safety of the vehicle, there have been a number of issues with paint and fit. Could these issues be related to Tesla’s hard push on Model 3 production numbers? Are there lapses in quality control that can be avoided if the pace of production slows down to match Tesla’s ability to ensure a higher quality of fit and finish? One clue to this is that there are far more customer issues reported about the Model 3 than there are for either the Model S or the Model X. Although this has not been validated in terms of numbers, the anecdotal evidence of this is certainly overwhelming. If that is, indeed, true, then it means Tesla still has a lot of work to do on the quality control front for the Model 3, as far as fit and finish are concerned. The more alarming implication is that if this goes unchecked, the higher they ramp up Model 3 production the more pronounced these problems will become over time. To be fair, Tesla is doing a lot to address such issues. They dropped two exterior color options a few months ago and reserved it for special orders. Musk even came out publicly and said they would repaint or replace the car if they didn’t do a satisfactory job prior to delivery. All this happened a few months ago, but the complaints persist. So, is Tesla slacking off on quality control once again because of the pressure to produce and deliver more Model 3s every quarter? It would seem logical that if this was indeed the problem, the bulk of such complaints would crop up around the cusp of two subsequent quarters. To elaborate, if a car was produced and deemed ready for delivery under extreme production pressure, that would likely be at the end of the quarter when Tesla is chasing numbers. The delivery might happen before the end of the quarter or at the start of the new one, considering the days-to-weeks delivery timeline for the Model 3 in the U.S.
That means the bulk of issues will have been reported in January, April, July and October. That’s the first month in each quarter, when cars produced in the last month of the previous quarter are likely to be delivered. To factor in same-month deliveries, we also included complaints reported at the end of each quarter – i.e., March, June, September and December. To balance it out, we only considered complaints raised during the second halves of those months. In short, we took a 45-day window straddling every change in quarter so that it would reveal trends, if any, in complaints. After a fairly comprehensive exercise reviewing about 50 or so separate post threads started by Model 3 owners, we came to the conclusion that the majority of the cars with reported paint and fit/finish issues were, in fact, likely to be produced during that 45-day window each quarter. To note, this is by no means a conclusive study since it’s based on a lot of assumptions with regards to the actual production date of the car. Unless we can work with VINs, that’s an impossible task. Think of it as more of a sampling of anecdotal data, with some validation in the form of data, videos or images, as made available by a few Tesla Model 3 owners. The results of our little exercise were very interesting, to say the least. We found that 57.8% of all paint-related complaints for the Model 3 were about cars that are most likely to have been made during the final month of each quarter, with delivery either during the final two weeks of the same month or the entire following month. Now, here are some other intriguing factors we need to consider. First, if we look at the entire production timeline from the first Model 3 produced, the majority of complaints were from April to December of 2018. This is the year that saw tremendous capacity increase on the production and delivery sides. Second, most of the complaints are from the periods between the second and third quarter, and the third and fourth quarter, with an escalation in complaints from one period to the next. Third, there seems to be a wide range of paint-related issues. If it was merely two or three issue types that kept cropping up over and over, we could pinpoint the real reason. With this kind of wide spread, that’s impossible to do. This is what we think has been happening. 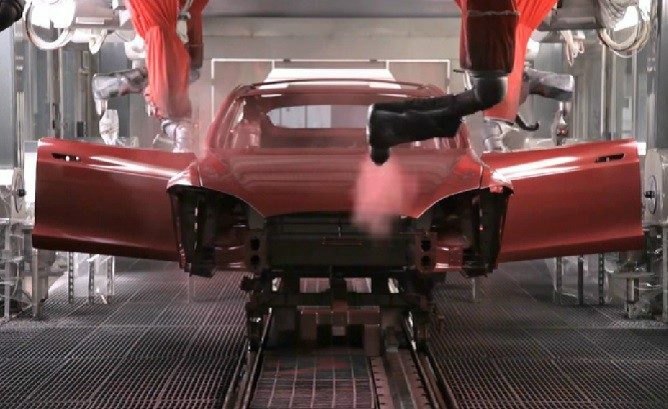 Despite Musk’s public reassurances of ‘quality first’, offers to repaint or replace you car if you aren’t satisfied with the paint job on delivery, and Tesla even setting up a team to handle at-delivery and post-delivery paint complaints, it is amply clear that their paint shop and quality control staff are under tremendous pressure. Tesla is a learn-as-you-go company. And strip away everything and it’s essentially a technology-driven company, not an automaker. They figure things out as they happen, as with testing Autopilot in live fleets of Tesla Model X, Model S and Model 3. They even have an early access program for new features, similar to beta versions of software or operating systems from Microsoft, Apple and other tech giants. It would appear that Tesla is struggling with a similar problem in paint shop output. The ‘beta’ problem here seems to be concentrated on Model 3, which is why we hypothesized that production surges were responsible for paint issues in the first place. Even though much of the paint shop process is now automated, there’s still a significant element of human input in terms of fit and finish. That’s where the real issue seems to be. Whether it’s about paint teams buckling under the pressure of chasing production numbers, or delivery commitments applying a reverse pressure on the production line, it’s clear that there’s a problem that needs to be addressed aggressively sooner rather than later. The worst case scenario is that the QC team for the Model 3 is giving undue leeway for paint quality because of those same pressures. The frightening inference that we drew from this whole exercise is that the problem is not going away. Cars delivered as recently as earlier this month continue to have paint issues. Q4 production will have already crossed that of Q3 per Bloomberg’s VIN tracker data, which means a significant number of cars delivered between now and the end of January could have paint and other issues. You can be sure we’ll be keeping our finger on that pulse. In closing, we honestly believe that Tesla is doing everything it can to make products of the highest quality possible. But it’s the word ‘possible’ that’s in question because it seems to be a dynamic entity, and has the overall effect of lowering the bar on what is otherwise the best electric sedan in the world by a wide margin. The paint quality issue not something Tesla can afford to have blow up in its face. So far, that hasn’t happened, and the majority of Model 3 customers seem to be thrilled with their latest acquisitions. But the issue must be nipped in the bud now that Tesla is on the verge of expanding the Model 3 experience overseas. Every single team at Fremont – not to mention Gigafactory 1 – will be stretched to its limits in 2019, including the paint and quality control teams. If a permanent fix is not found for paint-related issues, it will either lead to more delivery refusals or repaint requests. Both are bad for Tesla’s bottom line, which needs to be kept in the black this quarter and moving forward. Can a solution be found to immediately and dramatically reduce the number of paint issues? Perhaps, but we’re not counting on it. The only thing we can hope for is for Tesla to slow down its ramp just a little bit so specific teams at Fremont can catch their breath and make sure they produce the best results possible. Unfortunately, that might not be a luxury Tesla can afford at this point in time.